It certainly is hard to find The Brighter Side of life if you don't know where to look. And not every one can just take in all that life has to offer and enjoy the day at hand. My dad use to say to me, tomorrow is another day, and you can find the happiness in the days ahead. Today may not be your best day, but there's always tomorrow. Unfortunaetly not everyone sees life as the "glass half full". Which is where UMatter2.me comes in. 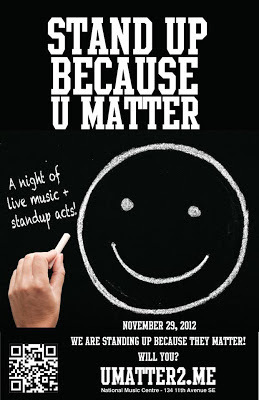 Studio Gorgeous has teamed up with Partners for Mental Health in support of Teen Suicide Awareness to say UMatter Thursday November 29th, 2012. Local business owner Karen Judge, in cooperation with Partners for Mental Health, is launching a day of awareness and action in support of teen suicide awareness called UMatter to help reduce the stigma of mental illness and encourage teens to reach out for help. The day’s events include a morning pep rally at Western Canada High School, sales of Mental Health awareness merchandise and will conclude with a Stand Up Because UMatter event at The National Music Centre (Cantos). Attendees will enjoy various stand up performances from a variety of local talent. Net proceeds from the event, in addition to merchandise sales, will be donated to Education Matters in support of the Arts within our public schools. “The Arts are a great way for all of us to express our thoughts and feelings”, says Studio Gorgeous president, Karen Judge. Teen suicide is the second leading cause of death among our youth. We don’t talk about it, understand it or support it. Partners for Mental Health is a national, non-profit organization dedicated to improving the way we think about, act towards and treat mental health. “Start the conversation about the cause with your friends, your family, and your co-workers. Spread the word for real, lasting change.” says Judge. The goal is to prevent teen suicide. And we can achieve this by raising awareness and informing people about one simple preventive action – to get parents and teens to understand there is help and hope by calling 211, where everyone’s story matters. Help other's know there is The Brighter Side out there! For more information visit www.UMatter2.me.